Everyone's been getting pretty darn excited over this whole flexible screen stuff, with many fantasising about roll up smartphones and bendy tablets, but it might be time to bring you all back down to earth. While the flexible screen industry is likely to take off in a big way in the next few years it won't actually be due to the fact the products they'll sit in will be malleable. As Giovanni Mancini, E Ink's Director of Product Management, explains it's more about weight and durability. "We introduced our flexible screen technology, E Ink Mobius, back in May. The idea of Mobius is not that people don't necessarily want to flex their device, but instead ensure it is very light and very rugged," he said. "We've done both research with our direct customers and with end consumers. We actually spent two days in a room with two-way mirrors in NYC where we gave end consumers various products sporting our flexible displays. "Over 90% of the people we brought into the room said they liked the idea that the devices were rugged and light, but the fact that they flexed was really just incidental." The technology is already being trailed in Sony's 13.3-inch Digital Paper which sees the Mobius display slide into a slender plastic shell to make it a rigid surface allowing users to write on the screen with a specially engineered stylus. "It has both capacitive touch and inductive touch, so you can use your fingers or a stylus. You can annotate the same way you do on paper with the stylus," Mancini explains. "It has one of the better stylus capabilities that you'll see out there, even compared to tablets. This type of device would be very difficult to do with a LCD screen because of the size and the weight - it would be very heavy and very fragile." "Here we have a device which uses our flex technology but isn't flexible, but it is rugged. You don't have to worry about throwing this into your backpack." There's obviously an interest in flexible displays when it comes to wearable tech, with us imaging a screen we can wrap around our wrist, but Mancini reckons it's more about conformity than flexibility. "You really don't want to flex a screen constantly, you just want it to conform to a particular shape and then you want to make it light and rugged." "There is a company called Central Standard Timing who put together a watch using our 1.3-inch Mobius display, which is the thinnest in the world at 0.8mm thick and it's a band which goes around the wrist. "You can flex the screen slightly, but it still has a hard shell, so you can flex it to the limits of that shell - just enough to get it round your wrist." 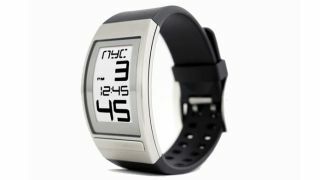 We were shown a prototype from E Ink so show off its watch-sized display and how it could easily fit into a curved chassis thanks to its flexible properties, but the main watch housing couldn't be bent or twisted. At some point in the future we may well be treated to proper, flexible devices, but for the time being at least it looks like the dream will have to stay in our head. Want more screen info? Then check out the future of touchscreens.